As much as I’d like a laundry room makeover, it simply isn’t in the cards right now. Maybe you’re like me and you’re stuck with a laundry room that doesn’t inspire you to…well…do laundry! Never fear, I’ve come up with some ways to update your laundry room on a budget. Nothing huge here, no knocking down walls or anything. We’re talking a DIY Laundry Room Makeover, no experts needed! Here are some Laundry Room Makeover Ideas that will have you inspired to tame the laundry monster in no time. Okay I lied, I can’t promise that because most of us probably aren’t inspired to do laundry no matter what…but you get the picture. Depending on the size and layout of your laundry room, some of these tips might work for you and some might not. You will have to go through and decide what will fit and what you really want to include in your space. Cabinets are always a great thing to have in a laundry room as laundry room cabinets hide the mess. We already have two cabinets over our washer and dryer that we will leave in place, so for me, it’s simply a matter of painting them. If you don’t have cabinets but want to install them, consider looking at your local lumber store as sometimes they have prebuilt options for cheaper than the big box stores. Of course they come unfinished and you can paint them whichever color you’d like. That’s the fun part! But if your space allows, hanging a drying rack is definitely a good option and one you can do yourself. Or if you can totally just use a portable drying rack like I do. We have one small ugly shelf between our two cabinets. I really want to add a long wooden shelf that can sit directly over the washer and dryer like this one. This would be a great spot to add some laundry room decor as there’s really nowhere else to put it. Shelving is great because you can cut it to fit your space. There are also a wide variety of styles, from basic wood to industrial metal. You can pick up a shelf or two affordably (check out my favorite places to shop for farmhouse decor here) or you can make one yourself. My hubby made the shelf that hangs over our coffee bar and I just love it. So I’m really hoping I can talk him into making one for my laundry room too when I’m ready to tackle the project. Laundry Room storage baskets are great for old rags, dryer sheets, laundry detergent pods, and odds and ends. They are definitely practical, but can also be used as decor for housing faux flowers, candles, knick knacks and more. They can be picked up very affordably at places like The Dollar Tree. You can even DIY those Dollar Store Bins and create stylish storage. Or watch for deals and pick up pretty ones at Decor Steals, Bits of Vintage or Antique Farmhouse. This is something that needs work at my house. I’ve always kept a laundry basket on top of my dryer (like for the last 25 years) that holds our dirty whites. Towels, socks, undies…they all go there. We have so much laundry as a family of 6, it’s just been easier for me to separate it this way. Even though the kids have their own baskets and do their own laundry, they still separate it and put their whites in the family basket (that mom washes) and then wash their own load of colored clothes. Then we have a couple empty baskets that go floating around the house (that are usually full of clean clothes) that I keep in my bedroom closet when they’re not in use. I don’t like this method at all and would love to store all my empty baskets in my laundry room area but have yet to come up with a way to do it in our small space. If you have the room, I love this idea of a laundry basket dresser to hold all your laundry baskets. Here are plans to build a laundry basket dresser for your laundry room if you’re the DIY type. If we had the space I would totally do this! Another option of course is to wallpaper. With everything I read about DIY wallpaper options, it’s too labor intensive for me so we’re going to go with painting our laundry room walls. Plus, I’m simply tired of the wallpaper look. I know we’re not ready to put in a new floor right now, plus when we are, it won’t be running all the way into our laundry room. But I’m ready for something new. After investigating a little I found this Laundry Room Reveal over at DIY Beautify and you have to see what they did to their floors! Read the DIY floor post here. I love that it was so affordable for their small space, which is what we have too. I didn’t even know about peel and stick tiles, I’m totally showing this to hubby and hoping to do it in our laundry room. My favorite part! Finding decor to makeover your laundry room is the fun part. And believe it or not doesn’t have to break the bank. Any beautiful pictures that you love will make great laundry room wall art. Whether it’s family photos, paintings, art prints, mixed media, drawings, or anything else, anything goes here. You are only limited by your imagination as you can find or create many of these on a small budget. There are plenty of really neat Laundry Room Signs. Personally I like the wood signs but I’ve also seen some really neat metal laundry signs. You can find everything from cute little sayings to just the words Laundry or Laundry Room. Handmade Laundry Room Signs are all the rage right now too and can be found at local shops and online. Printables are so popular right now. People love being able to buy something and have access to it right away. There are lots of online shops that sell laundry room printables. You can even find free Laundry Room Printables if you know where to look. Decals are an easy and cheap way to add a flair of decor to your laundry room (or any room, for that matter). They are usually super easy to apply and more affordable than getting an actual sign. It all depends on your budget and what kind of look you’re going for. Having rugs or mats to go in front of the washer and dryer are a must at my house. The fun thing about rugs is you can easily switch them up often. I like to have several of my favorites on hand, that way I can lay on down straight away while washing another. This is just the fun home decor that is there for no other reason than to make the room look nice. And to make you happy! Jars, shells, small wooden signs, figurines, antiques. Whatever your thing is, make sure to have a few pieces you love in your laundry room to inspire you. Because we all can use a little inspiration when we have to do laundry, right?! 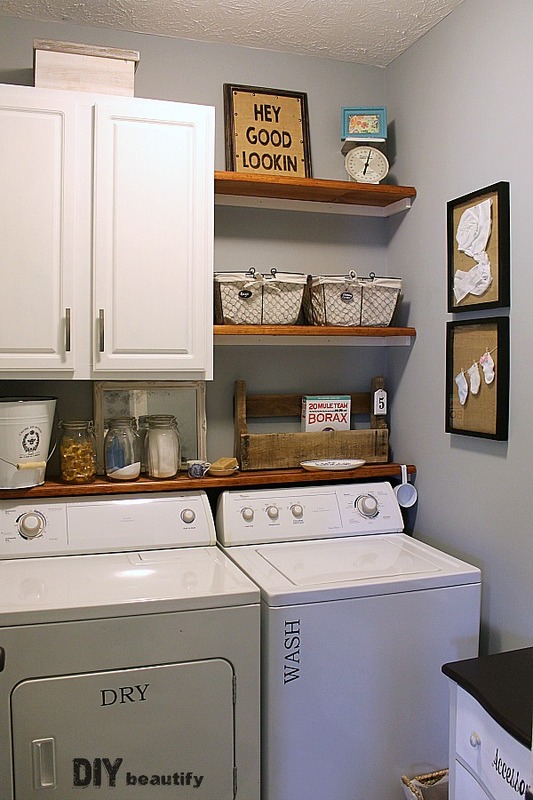 There you have it, super simple DIY Laundry Room Makeover on a Budget ideas! Which laundry room tips are your favorite? I’d love to hear your thoughts in the comments, and please be sure to share this on Pinterest if you found it helpful. Great set of suggestions, the laundry room is often neglected but the ideas you shared will make easier the task of renovating the room. Are you planning a tutorial on how to make those signs? Hi, Kimi! Great tips and suggestion. My laundry room lacks inspiration. I was wondering if you could tell me where do you usually purchase your decals? I hardly ever find good ones. Hi! Do you have a tutorial on the desk? It looks so cool! Hi Kimi, your blog is really useful for them who need perfect laundry. You mention all important things which needed in laundry room. We can do good makeover of our laundry in less cost. Thank you for sharing this post. Thanks for stopping by Alyssa! Where is the metal laundry basket on wheels from? Is ot a diy off a trash can or something? Hi Bonna, it’s from Cost Plus World Market, you can find it here: http://shopstyle.it/l/DEdE Thanks for stopping by!